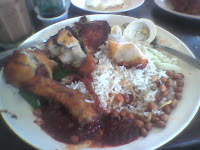 I couldn't quite remember when I had this plate of nasi lemak but I was going through my phone trying to clear unwanted images when I stumbled upon this picture. As always, I'm usually too impatient to wait before I sink my teeth into good food, resulting in a not so aesthetically pleasing photograph. Sorry!